One of the security patrol vehicles of Doo-Akpo security outfit in Bayelsa State. Trouble, however, started when occupants of the Camry on their way out, rained bullets into the police officers by the gate. 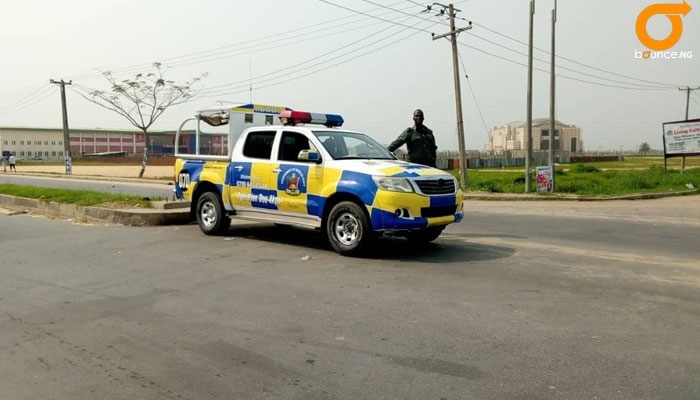 Bayelsa state Police command have launched a manhunt on some gunmen who shot and killed two police officers over the weekend. The officers were on duty at Udeme hotel, located along DSP Alamieyeiseigha Road at Opolo in Yenagoa, the state capital. Several shops built with planks lined up at the opposite side of the hotel. It was Friday night and while shop owners who sold mostly alcohol, fried meat and cigarettes were busy attending to their numerous customers, young night clubbers walked into the hotel premises with their partners. Music blasted from speakers positioned behind a shop. By 8:13 p.m., young men and women sat round plastic tables drinking and smoking. Standing by the hotel gate, were two armed police officers whose duty it was to safeguard the premises. By exactly 9:p.m., a Toyota Camry car drove slowly into the hotel. The unsuspecting police men saw the occupants of the car as customers who had come to enjoy and relax after a hard day job. They never knew that their end was near. They slumped and died while still clutching unto their guns. The sound of gunshots scared those within the vicinity. People ran helter skelter for safety. An eyewitness, who sells drinks opposite the hotel, Mrs Esther Nanawei, told Bounce News that despite noise from the sound of music inside the hotel, customers heard the gunshots. "During the commotion, the gunmen ran out of their car and collected two rifles from the dead officers. She made the signs of the cross on her face and continued: "For the gunmen to drive into the hotel, spend few minutes and come out means they surveyed their environment. "If they kill police with guns, what will happen to residents now?" she asked. Mr Paulson Doubra, a night clubber expressed displeasure over the manner armed young men kill people on a daily basis within Yenagoa. "Whenever horrible thing of this nature occurs, it's always men in Camry car." With his eyes closed, he drew on his stick of cigarette twice, puffed the smoke slowly toward the sky and continued: "Men in Camry stole 2 million Naira from a man, they killed a lawyer and stole about 10 million Naira from him and today, its police and their rifles. "The police boss should ask the army for help else, the Camry gunmen will continue to terrorise the state," he finalised. When contacted, the police spokesman in the state, Mr Asinim Butswat told our correspondent that they were sourcing for actionable intelligence to combat crime within the state capital. "It's quiet unfortunate that they had to pay the supreme price. "Death is part of the hazard of the job," he said. Mr Butswat further stated that they launched an operation on the day of the attack. "Based on intelligence, we raided a particular hideout and suspects were arrested. "They have volunteered useful information and we are working on it. "We sympathise with their families and we will not fail to unravel and bring to book perpetrators of the dastardly act," he assured their family members.